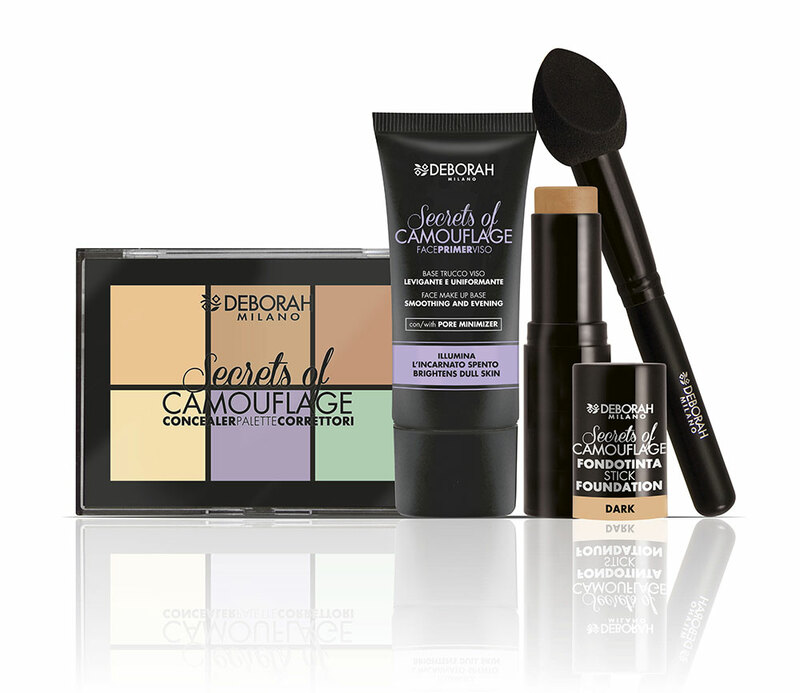 Deborah Milan spear Secrets Of Camouflage , a range of references that reveals all the useful secrets to minimize imperfections and discolouring and have a perfect incarnate . We show you a preview of all the references of the new Deborah Milano line and that surely will help you in the realization of the perfect face base ! You dream of one impeccable face base but still comfortable? 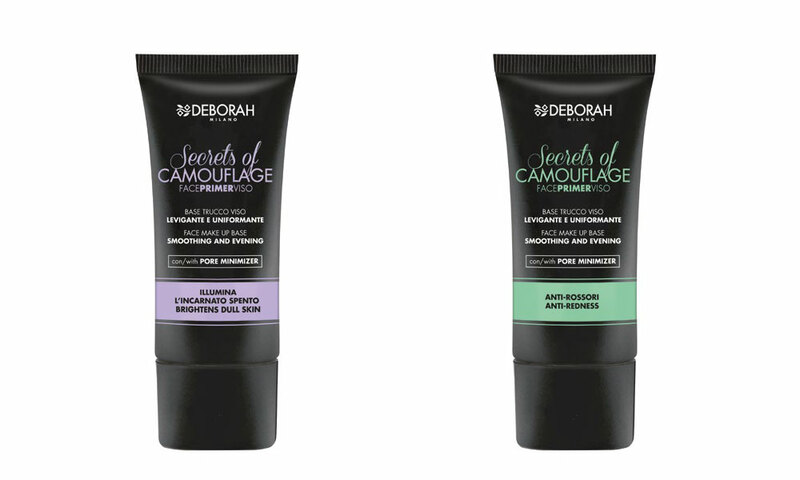 Deborah Milan spear Secrets Of Camouflage , a range of facial products designed for easily correct imperfections and discoloration. Taking advantage of the modern camouflage technique it is in fact possible to reduce the visibility of small imperfections and defects, without however characterizing the annoying “(from the French” camouflage “) mask effect “. The brand has thought exactly this: offer the maximum coverage without compromising comfort. Thus was born Face Primer , suitable for smoothing the complexion and minimizing easily dilated pores and discolouring before applying foundation. And again Stick Foundation , a stick foundation easy to apply and ad high coverage . The correctors proposed in the. Can not be missing Concealer Palette which sees the protagonist, a chromatic selection suitable to easily minimize any kind of imperfection. Finally a very useful tool in the application of our face base: Concealer Blender , a hybrid that sees the combination of a blender combined with the comfort of a face brush . In conclusion, Deborah Milan offers, through the new range of Secrets Of Camouflage , all that we need to get one radiant and uniform incarnate . The Face Primer proposed by Deborah Milan , is created to smooth the skin by uniformizing the tone before applying the foundation. Thanks to the particular formula enriched with a active pore minimizer , creates a perfectly smooth base free of visible imperfections . It helps in fact to polish, minimizing any enlarged pores , while the particular pigments, give brightness, offering a targeted corrective action . If you do not know when it is better to use this type of product, read our article dedicated to face primer . 02. Green Primer: green primer which reduces reddish and inflamed discolorations and skin imperfections. 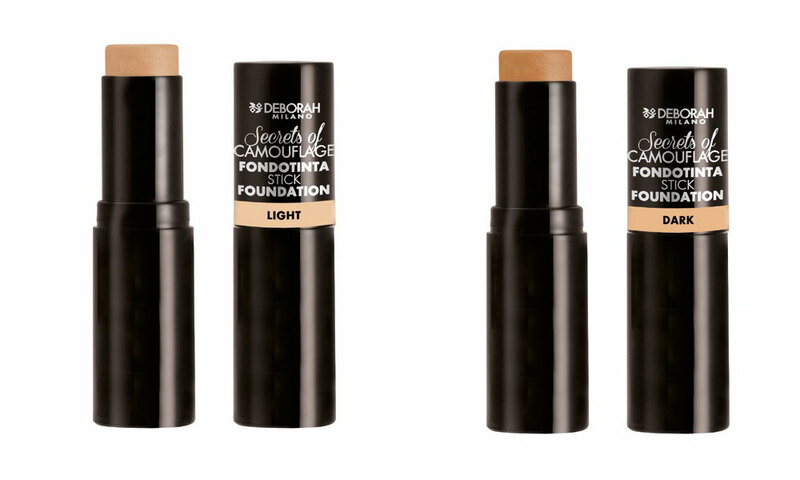 Deborah Milano proposes it Stick Foundation Secrets Of Camouflage , a stick foundation that offers maximum coverage thanks to the high concentration of pigments present in the formula. Suitable for all ages, offers one easy blendability and a light and natural end result. There formula characterized by a mix of Shea Butter , with nourishing properties, Rosehip butter , regenerating and antioxidant, and Macadamia oil with emollient properties makes the foundation very similar to a treatment. The packaging consists of one shrinkable stick makes the use practical and always fast, therefore suitable for those who want to combine practicality of use and optimal final yield. 02. Dark: dark / olive skin. 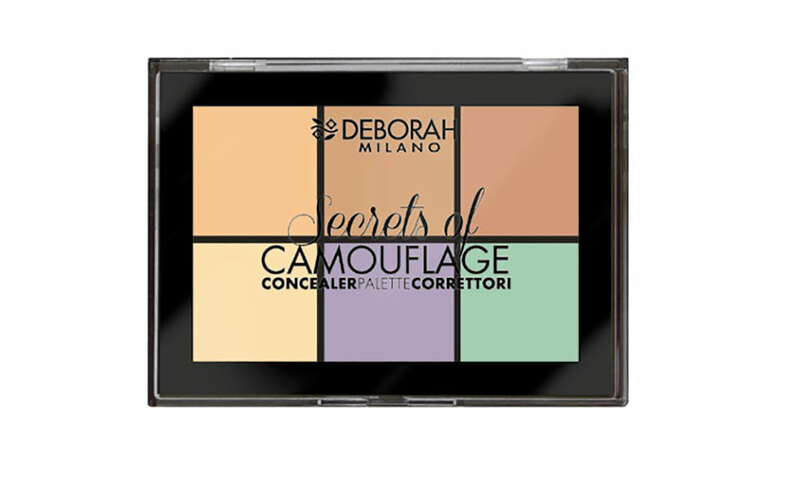 The new Concealer Palette proposed by Deborah Milan offers six shades of correctors designed to correct imperfections and any type of discoloration. Thanks to the technique “Color correcting” based on the complementarity of colors , offers all the colors necessary to carry out any type of correction. The you are shades present inside the palette, can be combined with each other or used individually depending on the type of complexion and defect to correct . In fact it contains 3 shades of beige that help to hide imperfections such as spots, small scars and irregularities. Yellow: helps to reduce evident bluish circles. The back of the product offers a mini-tutorial which illustrates how to best implement the “color correcting” technique. 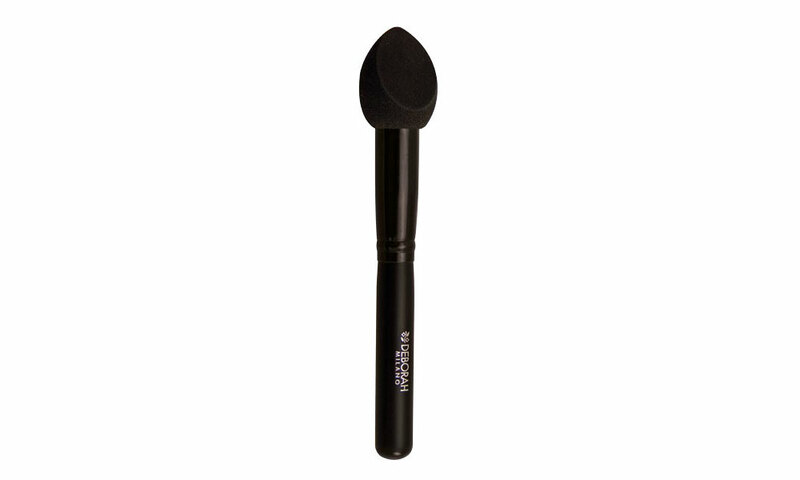 The collection ends Secrets Of Camouflage Concealer Blender , a practical applicator with a handle similar to a brush and limited edition. Suitable for the application of correctors or foundations in cream thanks to the particular conical shape of the sponge allows a dual use, making it practical and versatile. The flat section allows one precise drafting and targeted while the round one determines a modulable application in order to get different coverage levels . In short, it turns out to be practical as a brush, but performing exactly like one blender . 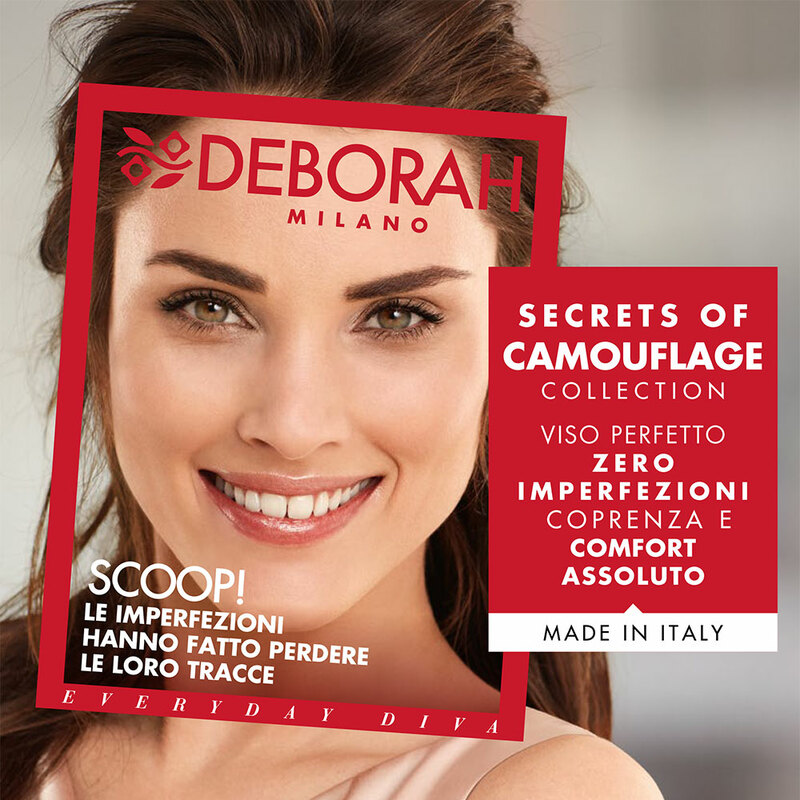 All the products of the Secrets Of Camouflage line proposed by Deborah Milan , will soon be available at the perfume shops of the brand and in the corner Deborah Milano . And what do you think of this camouflage line? Have you found any reference that may be useful to you?